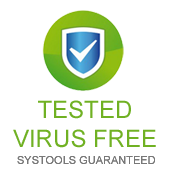 We ensure your system security and data safety. That why we recommend our professional SharePoint recovery software. This professional tool facilitates to safely recover SharePoint files including all crucial information which is stored on your SharePoint Server. SharePoint Server has a combination of various products and software essentials. MS Office SharePoint Server (MOSS) is a shared web portal application which is based on Windows SharePoint Services (WSS) platform. It hosts websites that contain shared workspaces, content databases, lists, document libraries etc. All the databases information is saved in .mdf file. Corruption Issue: There are several of unexpected reasons which may cause of corruption in database. In other words, SharePoint MDF file can damage due to slow operation SharePoint Server, virus interruption, sudden shutdown etc. SharePoint database recovery tool is well-known application which is competent to restore SharePoint document library, files, wikis, and alerts without any data harm. We provide SharePoint document recovery tool demo without any cost. It let you learn how to recover SharePoint documents, database, lists, sites, files etc. However, this free trail only shows the preview of recovered items. To export/save entire items on SharePoint Server or local location, you need to obtain the full fledged version of this SharePoint recovery software. Recover entire databases (permissions, metadata, custom views, alerts, workflow state & associations) in exact form. Locate & preview any item inside multiple database backups before restoring it. System Security after Software Installation: You might find many other tools for SharePoint recovery, but if any software brings viruses or other harmful threats to your computer system after installation, then that software is destructive instead of being useful for revival. From the positive feedback of numerous satisfied clients, we can confidently state that our SharePoint database repair application will not bring any viruses or other harmful threats to your system after you install it. No Harm of Data: We know the importance of your data that's why our developers designed this tool in such a way that does not harm your data. Your original data information will not be altered, deleted or damaged during the SharePoint 2003, 2007, 2010 recovery process by using our software. 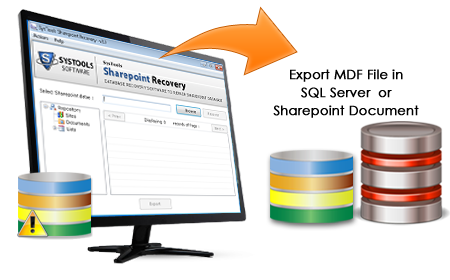 After buying our software, you are also able to recover SharePoint sites which were deleted earlier. It allows you to save all recovered items to your system as it is fully functional and the file saving option in enabled. Obtain the personal license for JUST $129! Our support professionals provides totally satisfactory clarification for your doubts related to the product. "Great Tool!! I really surprised after getting the superb result via SharePoint recovery software"